NoshGirl Chef: Battle Strawberry and Black Pepper! Happy Monday, everyone! Voting for the third NoshGirl Chef Challenge is now OPEN! As you may recall, the secret ingredients were strawberries and black pepper – and I love the variety of original entries we got! Pop on over to their blogs to check out these scrumptious recipes! Mmm, I do summer fruit! Check out these creations on each contestant’s blog! Then comment below to let me know your fave. If you’d prefer to keep your vote private OR if you have problems commenting on this post (wahhh, Blogger), email me with your vote and I’ll count it as well :). You have until this Wednesday, 11:59PM EDT to vote! Good luck, challengers! Interested in participating in a NoshGirl Chef Challenge? Email me! i'm constantly amazed by the creativity and yumminess of the recipes everyone comes up with! i'm going to vote for the strawberry glazed ribs–they seem so summer to me! They all look amazing, but I'm going to have to vote for the blackened mahi with strawberry chutney. Such a creative and delish idea! Oh my lord. THOSE RIBS! I am practically drooling. The ribs get my vote! Clever with the ideas, I would've never thought of them. My vote goes to Ruffles & Truffles' Blackened Mahi with Strawberry Mango Salsa. So original and summery, love me some fish. The blackened mahi gets my vote! I think my husband would love me forever (oh wait he already has to) if I made him that blackend mahi … yummm!!! That's my vote! It’s good to get a fresh way of loonikg at it. This is SO HARD. It all looks great – I'd eat every single dish. 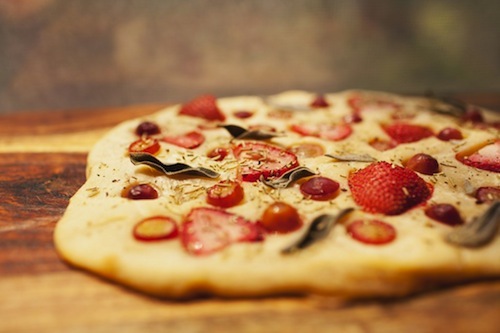 But, I'm going to have to go with the strawberry grape focaccia because it's quite unique. Sweet and Spicy Strawberry Ribs! They look so juicy! The blackened mahi gets my vote! I love mahi and the strawberry mango salsa looks so refreshing! My vote is for the blackened mahi and the strawberry mango salsa. It sounds amazing and I can't wait to make it! Love the strawberry glazed ribs! I could practically taste them as I read about them! Love that you acted right then! I am more of a morning person now after two rounds of Hello Mornings and prayer for God to increase my self-discipline. Naturally I am more of a night person. However, a friend recently joked that she doesn’t really like staying up late or getting up early…so we agreed she is just a “sleep person!” That’s probably the best description of me too. Everything looks delicious but I the ribs! OMG! Reading these recipes before lunch is making me ravenous. I'm a sucker for ribs so that gets my vote! Wow!!! I love the creativity here! Strawberries & ribs just blows my mind. Then again, strawberries on pizza does too. But ultimately I'm voting for the mahi because I want to eat that whole dish right this minute. It screams delicious, light and summery to me. I was thinking I'd volunteer for a challenge, but now I'm a wee bit intimidated! These all look fantastic, but my vote goes for Ruffles & Truffles' Blackened Mahi with Strawberry Mango Salsa! 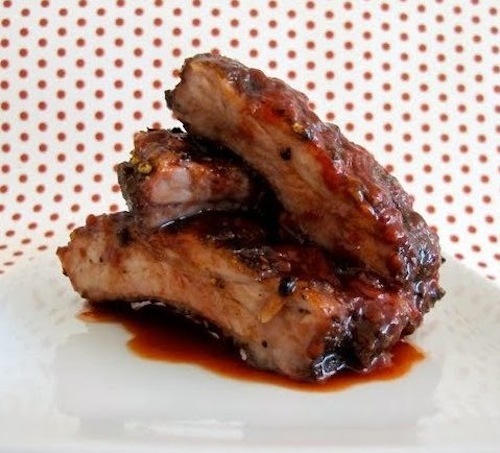 The mango strawberry chutney is calling my name, but the savory ribs gets my vote. they all look delicious, but my vote goes to the blackened mahi! Definitely the Mahi with the strawberry mango salsa – can't wait to try it! The Blackened Mahi for SURE!!! YUMMY..
Definitely the Blackened Mahi with Strawberry Mango Salsa. I can't wait to get the recipe! I'm liking the blackened mahi! Katie's blackened mahi… sound delish in a taco! I vote for the focaccia! I want to eat that for breakfast, lunch and dinner! I'm going to go with the blackened mahi, looks so fresh and delicious. My vote goes to the strawberry grape focaccia!! My Vote is for the Blackened Mahi with strawberry chutney. Yum! My vote is for the strawberry grape focaccia! Yum. Def Ruffles and Truffles Blackened Mahi! Looks amazing…and I bet it tastes as good as it looks too! Strwberry grape focaccia!!!! It's delish! The blackened mahi looks and sounds amazing! Just right for summer. It gets my vote. all dishes look so good! i wish i could taste them all. but if i had to choose, i vote for ruffles and truffles dish. it's something i would love to eat on a sunny summer afternoon. How am I supposed to choose?! I'm going with the foccacia, but only because I am a carb fiend and love me a delicious twist on any kind of bread! Gotta go with the Ribs. OMG. The mahi looks good. It gets my vote! I don't see why I shouldn't be able to try all three before I vote. Ahem . . . waiting for deliciousness to arrive by fedex. Fine. I guess if they're not coming, I'll vote for the ribs. Ooh…hard decision. Im going to go with the blackened mahi with strawberry-mango salsa though. Yum! They all look super yummy, but I have to vote for the ribs, I never would have thought to do that. SO YUMMY!! I'm dying!! My favorite is the strawberry grape focaccia. I would love to taste that. Yum!! I like them all – they definitely remind me that summer is officially around the corner. Of the three, the ribs get my vote! Mmm the ribs sound divine! I made the Blackened Mahi last night and it was amazing.. I vote for Ruffles and Truffles. WOW! Such a tough choice, but I have to say Ruffles & Truffles Mahi looks amazing to me! I'm going to vote for the blackened mahi with strawberry chutney! I love fish – voting for the mahi! Ruffles & Truffles' Blackened Mahi with Strawberry Mango Salsa gets my vote. Looks delicious! The blackened mani looks amazing! I'm going to have to go with the blackened mahi but they all look amazing! My vote is for the sweet and spicy strawberry ribs. They look so yummy! My Vote is for the Salsa Mahi one. I'd go for the mahi and the strawberry mango salsa – looks like the perfect summer dish! 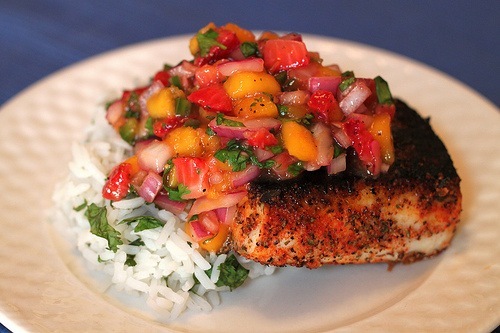 Katie's blackened Mahi with strawberry mango salsa gets my vote. It looks delish! I vote for the blackened mahi! Everything looks so delicious! I gotta go with the mahi…the colorful salsa is fabulous! Big Apple Nosh: NYC Food Blog | New York | Food | Restaurants | Recipes | Reviews | NoshGirl Chef Challenge #3: Last Day to Vote! Big Apple Nosh: NYC Food Blog | New York | Food | Restaurants | Recipes | Reviews | NoshGirl Chef #3: We Have a Winner!